In 2018, Constellation EME customers collectively saved 80,000 megawatt hours of electricity and prevented the emissions of 36,000 metric tons of carbon dioxide. With refrigeration ranking as the third highest category in electricity consumption, the cold storage industry is a prime target for efficiency and demand management solutions. Frozen food manufacturers and distributors, grocers, and other retailers can all benefit from the efficiency gains and load shed capabilities of TES. 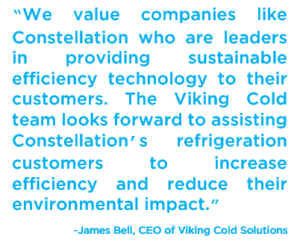 Viking Cold’s TES systems provide customers with a proven solution to meet their temperature requirements while managing the energy costs of their storage freezers. Viking Cold’s innovative application of Phase Change Materials combined with intelligent controls, and 24/7 remote monitoring increases energy efficiency an average of 26% and adds time-of-use flexibility to avoid demand-based pricing for up to 13 hours while improving temperature stability. Viking Cold Solutions is the leading thermal energy storage provider to the energy-intensive frozen/low-temperature cold storage industry. 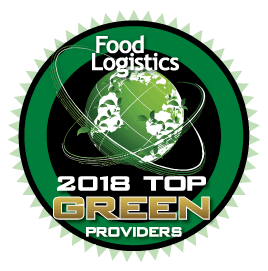 Viking Cold delivers cost-effective and flexible energy management services which preserve food and help reduce environmental impact. Its patented Thermal Energy Storage system with phase change material (PCM), intelligent controls, and 24/7 cloud-based monitoring, allows customers to reduce cold storage energy costs by up to 35 percent, or more, while improving their temperature stability and maximizing refrigeration efficiencies. Viking Cold Solutions’ TES systems have been Measured & Verified and incentivized by energy utilities across the U.S. and are currently in use around the world in grocery stores, low-temperature warehouses, and restaurants. For additional information, please visit www.vikingcold.com. Constellation is a leading competitive retail supplier of power, natural gas and energy products and services for homes and businesses across the continental United States. Constellation’s family of retail businesses serves approximately 2 million residential, public sector and business customers, including more than two-thirds of the Fortune 100. Baltimore-based Constellation is a subsidiary of Exelon Corporation (NYSE:EXC), the nation’s leading competitive energy provider, with 2017 revenues of approximately $33.5 billion, and more than 32,000 megawatts of owned capacity comprising one of the nation’s cleanest and lowest-cost power generation fleets. Learn more at www.constellation.com or on Twitter at @ConstellationEG.